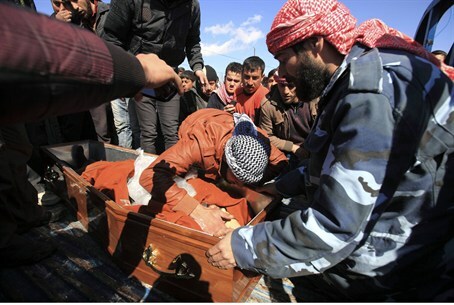 Syrian forces reportedly executed 47 Syrian soldiers who tried to defect in the city of Idlib on Saturday. The bodies of the soldiers were then dumped in al-Seeha lake near Idlib by Assad loyalist forces, a local coordination committee from Idlib reported. The regime of President Bashar al-Assad is currently beset by an armed insurgency mounted by the Syria Free Army. The SFA, which consists of some 20,000 army defectors armed as light infantry, has mounted numerous lethal ambushes and hit-and-run rains on loyalist troops. Fighting in Idib, where the mass execution is reported to have taken place, is said to have been particuliarly heavy. The SFA has a virtually free reign in the north of the country, and have been involved in the heavy fighting in Homs, which Syrian forces continue to pound with artillery. Human rights activists told Voice of America at least 700 have been killed and thousands wounded in four weeks of shelling in Homs. According to reports, forces loyal to Assad fired mortars on at least four neighborhoods across Homs Saturday, including the rebel stronghold of Baba Amr. Syrian state TV showed images of the destruction, and interviewed people who claimed to be residents of Bab Amr and alleged they had been held hostage by “gangs of armed terrorists." The state-run SANA news agency reported Saturday that Syrian authorities had restored the “security and safety” of the neighborhood, following Thursday's SFA pullout. In Damascus, the bodies of two Western journalists killed in a shelling attack on Baba Amr last week were handed over to diplomats in Saturday. The French ambassador to Syria received the remains of French photographer Remi Ochlik, while a Polish diplomat received the body of American-born journalist Marie Colvin. Poland, in the absence of US embassy staff in Damascus, is acting as the US protecting power in Syria and is tasked with assisting US citizens remaining in the country. UN secretary general Ban Ki-moon demanded unconditional humanitarian access to Syrian cities, saying there were "grisly" reports of summary executions and torture in Homs. Last week, Syrian officials had promised to allow relief convoys to enter the city, but ICRC officials say they continued to be barred from Homs for "security reasons." Red Crescent operations chief Khaled Erksoussi told AFP, "The authorities told us that we're being denied access for security reasons." "The Syrian authorities must open without any preconditions to humanitarian communities," he said. "It is totally unacceptable, intolerable. How as a human being can you bear ... this situation." Amid the ban on relief convoys, residents from the prosperous city of Aleppo have reportedly risked their lives to smuggle food and medicines into Homs. However, the road from Aleppo to Homs is marked with checkpoints of the much feared Mukhabarat intelligence service. Stopping every vehicle, they compare identity cards against the now extensive list of people suspected of joining the Syrian opposition. Convoys of buses carrying Syrian troops have been reported on the highway, while tanks are stationed strategically on bridges and in open fields.